The Thompson's On TV: FREE JEANS!!!! Okay well, I thought I had heard it all until I stumbled across a lady who will insure your jeans and in the event you loose weight she will send you money to buy new jeans!!! So how it works basically is this: You go out and buy jeans, you then mail her the receipt and 30% of the price of the jeans to pay for your insurance. So let's say the jeans cost $100, you send the receipt and $30. When you loose weight and are in a new size she will send you the original price back to you. So with my example you buy the jeans and for get your original purchase price back. Meaning you pay $30 to get a new pair of jeans. 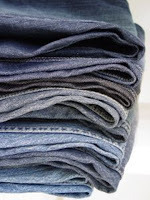 There may be a catch about you sending your old jeans to her as well. I think she plans to either donate them or start a jean swap thing. What do you think? Is it worth the trouble? Heck I'm not even sure they will deal with Canadians but I sent in my receipt and money... We'll see! what a cool idea. Let us know it it works out! I may be inspired by your story to drop a few pounds too! you really are a great role model for us plus size ladies!